Buster Olney reported via Twitter that the Mets in fact did reach out to the veteran lefty first baseman but their level of interest has yet to be determined. In my opinion, the Mets should go ahead & make the low-risk / high reward move in signing Adrian Gonzalez. Such a signing would allow Dominic Smith to start the season off in a great hitter’s atmosphere until he gets into mid season form. Worst case, he could get a full season of reps in Las Vegas with the teams AAA affiliate. Last season, Smith had 457 at-bat’s with the Las Vegas 51’s before getting the call from Sandy Alderson to join the big league club. Once he joined the Mets, Smith displayed some obvious holes in his play in 49 major league games. However, I do truly believe he was worn out by the time he got the call up. Smith hit just .198/.262/.395 while hitting 9 home run’s & driving in 26 runs. Smith was ranked 71 by Baseball America & 63 by Major League Baseball in their own respected prospect rankings before the 2017 season began. 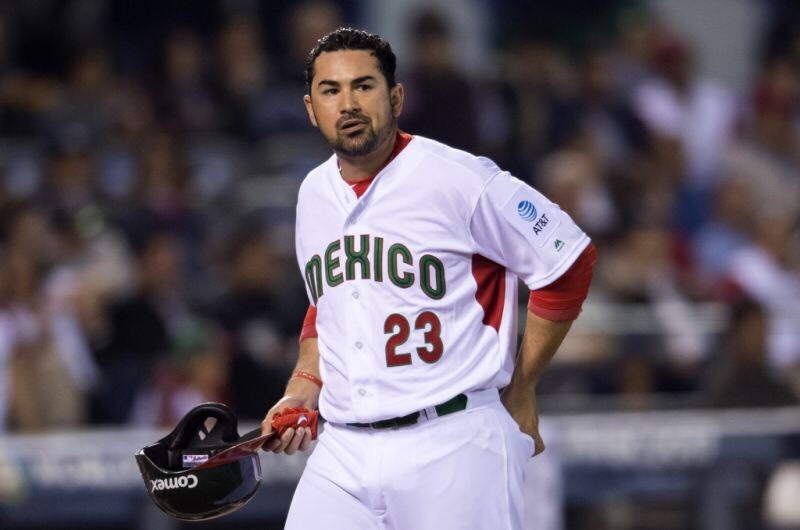 While I rarely lobby for the Mets to sign a 35 year old with a janky back, I believe Gonzalez would be a good placeholder at first… at least for half a season. Since he probably could be had for the league minimum, there isn’t much of a risk & on the upside, Gonzalez is a career .288 player with 311 home run’s in his 14 years served. Gonzalez only hit .242/.287/.355 in 2017 while playing for the National League Champions, the west coast’s Yankees, the Los Angeles Dodgers. Gonzalez appeared in just 71 games, accumulating 232 at-bats in a season cut short due to a back injury. So if Gonzalez doesn’t pan out or if he has another season shortened by injuries, the Mets can rely on a Dominic Smith that would be in mid season form. However, if the Mets don’t make a move for a first baseman & Dominic Smith just isn’t quite MLB ready yet, it’ll be a long season for the young man & that might take it’s toll on his confidence. Previous Bruce to the Mets has become more realistic. Good signing if he will take major league minimum. LOVE him for his leadship qualities also. Imagine if he and Dom Smith both play well. We might even be able to flip A-Gon at the trade deadline.